PrettyFit is a women’s fitness and health subscription box. You can preview the boxes before they ship and skip any month you aren’t interested in. You can also request to receive a different pack if it is still available, instead of the current month’s pack. 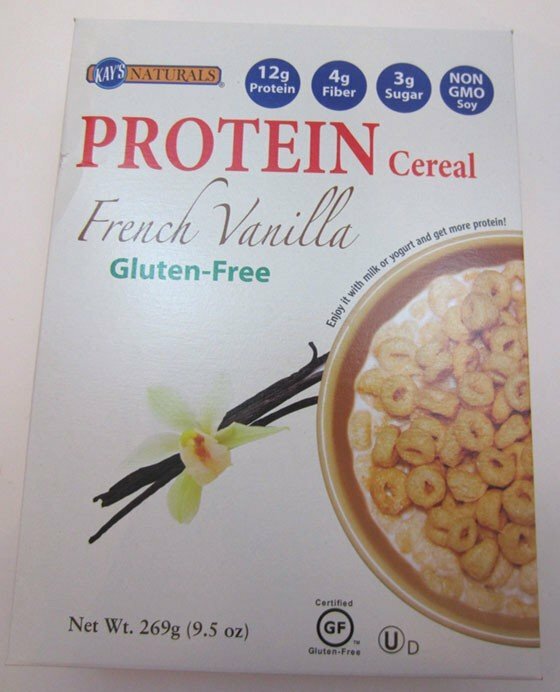 This review is for the Healthy Protein Pack (which is still available as of the time I’m writing this review). I liked the way these tasted, but they had a strange texture (very uniform and almost homogenized, though you could actually see the chocolate chips in the second one). These are very high in added sugar (probably why I thought they tasted good) and didn’t contain much fiber. This may work for you if you use bars as workout fuel but I, personally, just can’t eat anything for a few hours before I exercise. I guess they had to think of a name for the flavor and this does have chocolate in it. But it doesn’t have much else in common with a brownie. This has soy protein crisps in it, which are a little like crisp rice cereal. These are gluten free and vegetarian, but not vegan. I have liked other Nogii products better, but this wasn’t bad. The vanilla flavor was definitely noticeable. These were like a crunchier version of Cheerios. For a gluten-free product, the texture was not bad. I happen to prefer whole grains but this is a nice option for people who can’t have wheat. Sadly, I did not get to finish the box because there was an incident involving several items (including this cereal and an unopened bottle of maple syrup) falling out of the pantry and making a huge, sticky, glass-encrusted mess on the kitchen floor (don’t ask). I loved these. But if you make something chip-like and vegetarian and make it cheese-flavored, I am very likely to love it. These had a crunchy texture and were wonderfully salty and I am just looking for an excuse to buy a whole case of them. I am a big fan of microwave cake so of course I was interested in microwaveable muffins. You add water to these and stir, then cook for about 35 seconds, then let it sit for a bit. For convenience foods, these are all right. They’re not the same as bakery muffins by any stretch of the imagination, but they’re also not as loaded with calories. These are supposed to contain probiotics, but I am not sure that bacteria could survive being microwaved, so I’m not sure how useful that part is. Also these are really hard to get out of the container once prepared. You can’t buy this separately so I had to use the value PrettyFit gave for this product. That makes it about $3.49 a packet, which is not so unusual for individual packets of protein powder. I have been mixing one packet a day into a smoothie with frozen fruit and almond milk. Being whey, this dissolves pretty well and doesn’t clump (I recommend an immersion blender for best mixing results). This is not artificially sweet, which is great. Verdict: I calculated a value of about $80.19 for this PrettyFit box. PrettyFit advertises it as being over $80 in value so it’s pretty close (their estimates on some of the values of the items are a little high, I’d say, if you look at the page for this pack). For a box consisting entirely of food, it’s an excellent value for the cost. Plus most of the items and brands were new to me, which is great. Can you buy that chocolate spread anywhere? By itself? I’m also wondering if it comes in a Peanut Butter flavor? My husband uses that PB5 powder peanut butter but he says he wants to find something else b/c the flavor is kind of dull. If you click the link on the product name, it takes you to the manufacturer’s website where you can buy it. (I do think there are other flavors though I don’t remember what they were.) I’m pretty sure it’s also available on Amazon. Thank you for the info! He’ll be so excited to try something new! Yes Buff Bake has a bunch of flavors and the also come in sampler size packets!